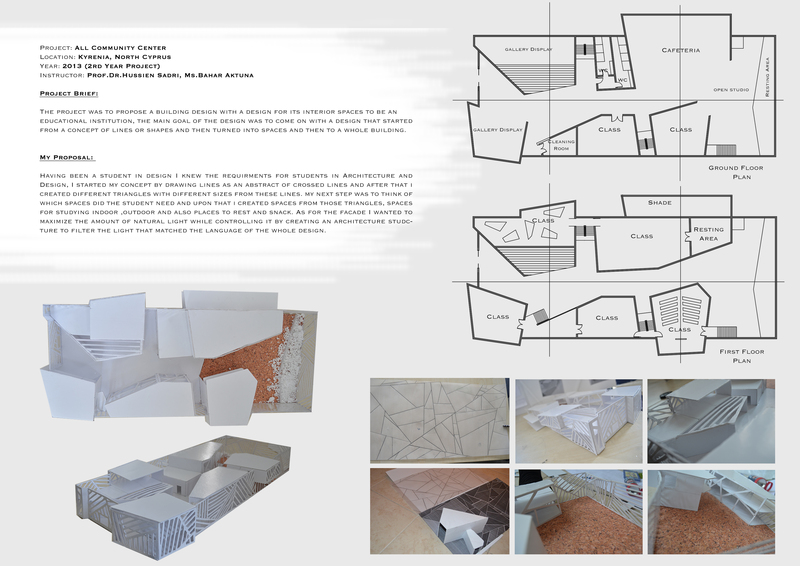 The project was to propose a building design with a design for its interior spaces to be an educational institution, the main goal of the design was to come on with a design that started from a concept of lines or shapes and then turned into spaces and then to a whole building. Having been a student in design I knew the requirements for students in Architecture and Design, I started my concept by drawing lines as an abstract of crossed lines and after that i created different triangles with different sizes from these lines. my next step was to think of which spaces did the student need and upon that I created spaces from those triangles, spaces for studying indoor ,outdoor and also places to rest and snack. As for the facade I wanted to maximize the amount of natural light while controlling it by creating an architecture structure to filter the light that matched the language of the whole design. © 2019 • All content within this entry is strictly the property of Hatem Al-Harazi, and is not for public use without permission.